OPTIMA® Batteries, a worldwide leader in high-performance batteries, today announced the addition of OPTIMA Chargers Digital 400 12V Performance Maintainer and Battery Charger to its new line of battery charging products at the automotive aftermarket industry’s SEMA Show. 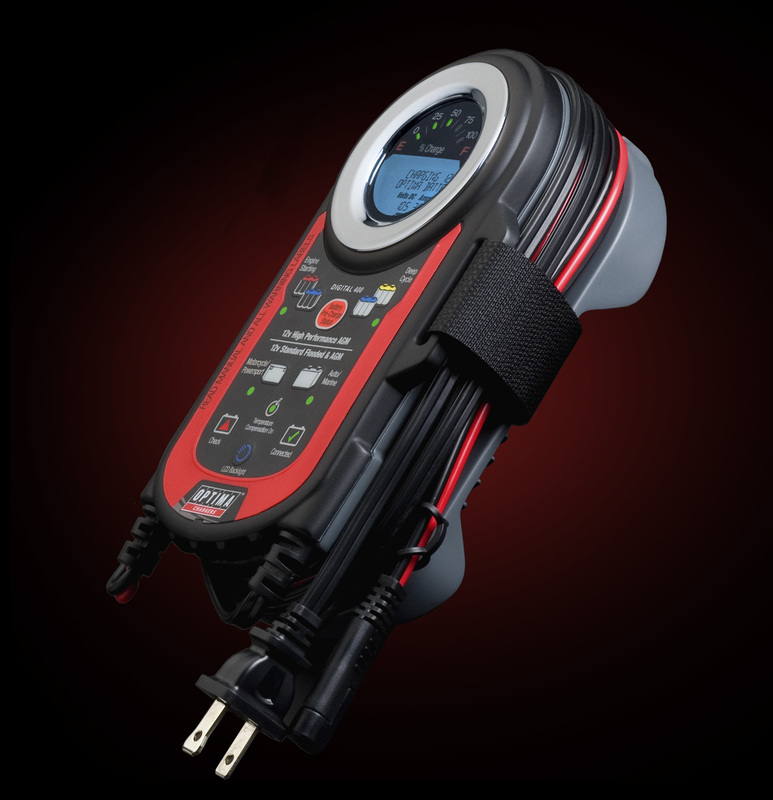 Unlike the Digital 1200 12V Performance Battery Charger, which was released earlier in 2012, the new Digital 400 is more compact and can easily be used to charge and maintain a variety of vehicle segments including those in the motorcycle, powersport, and lawn and garden categories. The OPTIMA Chargers Digital 400 12V Performance Maintainer and Battery Charger will not only extend the life of a vehicle's battery by keeping it charged when not in use, but at $109.99, is ideal for everyone – from everyday drivers to owners of powersport vehicles. The Digital 400, which can recover discharged batteries that others cannot, is compatible for use in automotive, truck, marine, motorcycle, powersport, lawn and garden, and RV applications. The new product has a charge rate of up to four amps on large batteries and three amps on small batteries and can be utilized to keep all 12V AGM and flooded batteries healthy during storage. Additionally, the Digital 400 will automatically maximize battery life and performance with OPTIMA’s built-in battery health mode. Beyond improving the performance and life of OPTIMA and other AGM batteries, the Digital 400 is also incredibly user-friendly with an at-a-glance battery indicator and check battery icons. The product is both compact and portable and will come with a wall bracket and useful hook for easy and flexible use. Dual-purpose hook and tilt design allows for in-vehicle hanging or angled stand viewing. Users can hang the Digital 400 on their garage wall with OPTIMA's wall organizer bracket. The product also includes battery clamp and DC ring terminal cable storage. With spark-free connection technology, reverse polarity, ambient air temperature compensation during charging and over temperature protection, this product is safe and easy to use. The Digital 400 ensures a simple set up process with pre-charge battery status display mode. It also provides a backlit hybrid LED/LCD display for charging, maintaining and fault mode indication. The unit gauge displays battery charging (fill) rate with charger mode and fault messages. Finally, LED indicators prompt users for quick and easy selection of charge and maintain profiles by battery type including AGM and standard flooded batteries. Last year at the 2011 SEMA Show, the brand introduced their first battery charging product, the OPTIMA Chargers Digital 1200 12V Performance Battery Charger, which enhances the performance of OPTIMA and other AGM batteries, recovers deeply discharged batteries and extends battery life. While owners of the OPTIMA Digital 1200 can utilize the product to provide a faster charge with more amps, the OPTIMA Digital 400 is an ideal high performance solution, especially if the user has multiple vehicles to maintain. For additional details about both OPTIMA Chargers products, visit the OPTIMA Battery Chargers page.